This past week I went to Disneyland for the very first time! My in-laws took me and Smalls and we had a great time. We rode a ton of rides and Smalls got 28 autographs in her new little Disney autograph book (and we took pictures of her with the characters too, of course)! Also, my sister-in-law, who is a Disney pin connoisseur, gave us all little baggies of pins to trade, which made for a fun extra to our time in the parks. 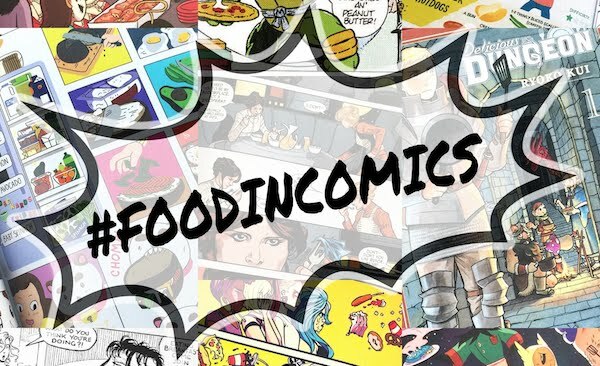 The Disney parks are known for the things mentioned above as well as shopping and shows, but also food! My goodness the food. From Mickey-shaped soft pretzels and ice cream bars to hearty European fare and tangy shish kabobs, everything I had was scrumptious and the portions were definitely filling. 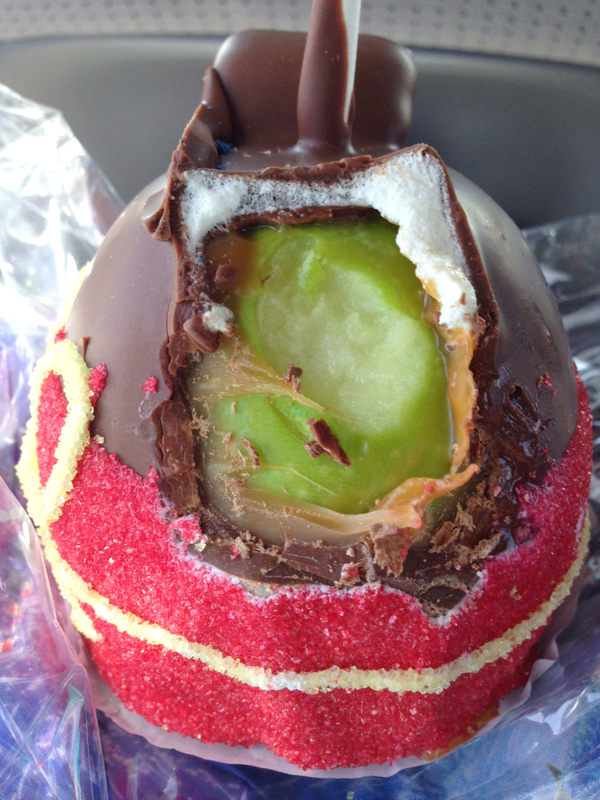 A particular food that stood out to me, a dessert/treat, were the impressively crafted, character themed, caramel apples. I took a few photos and talked with a super nice cast member named Bobbie at the Candy Palace on Disneyland's Main Street U.S.A who gave me the low down on these decadent treats (for more info about The Candy Palace check out this article on "Disney Food Blog"). – A dedicated team of candyteers create not only the apples, but every other treat for the shop during the wee hours of the morning & then some items throughout the day for people to see through the special viewing window. – Only the best, most beautiful, large, green, granny smith apples are used. 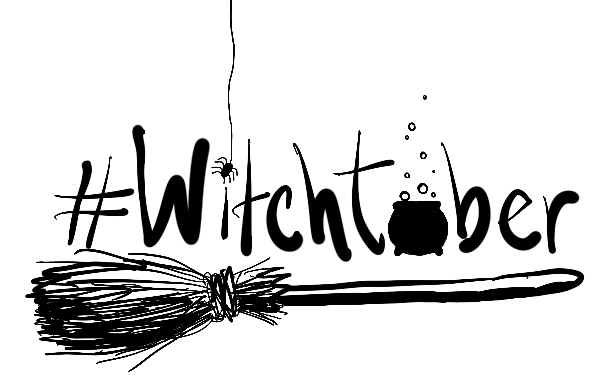 – The apples are skewered upside down, halfway through, with thick, pointed, paper lollipop sticks. – The apples are then dipped completely in melted caramel & smoothed out/around. – If a Mickey-eared apple is being made, two large marshmallows are used, one side of each cut to be flat, & then stuck, flat side down, to the caramel to become the ears. – The apple is then submerged in either milk chocolate or white chocolate or colored white chocolate & left to solidify before the next step. – If decorating/colored sugar is needed, the apple is dipped in a thin, melted, white candy coating (like candy melts) & then the sugar is spooned on (ex. 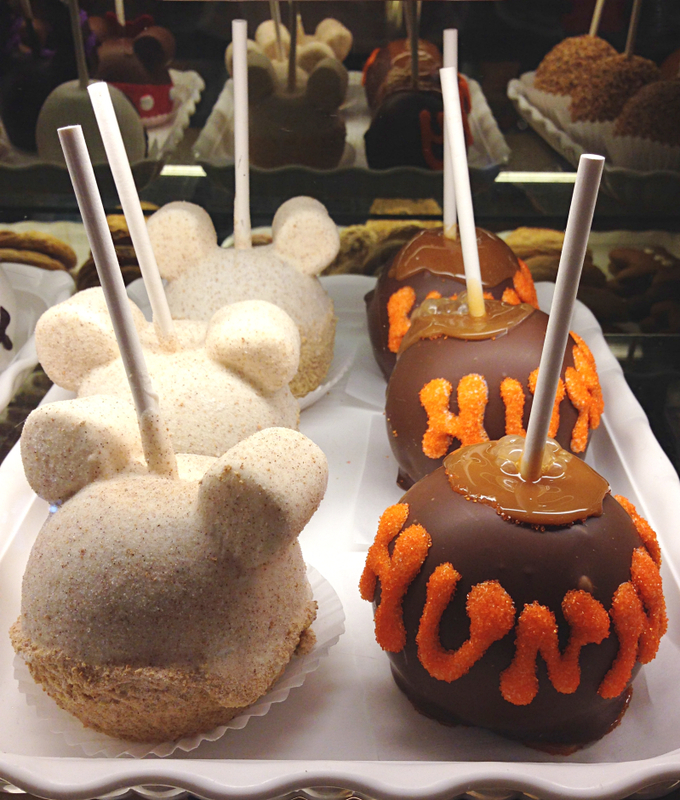 see the Mickey & Minnie apples at the top of this post). – The finished apples are placed on white cupcakes liners. – If you plan on getting one, sit down and eat it soon or it might melt in the heat! 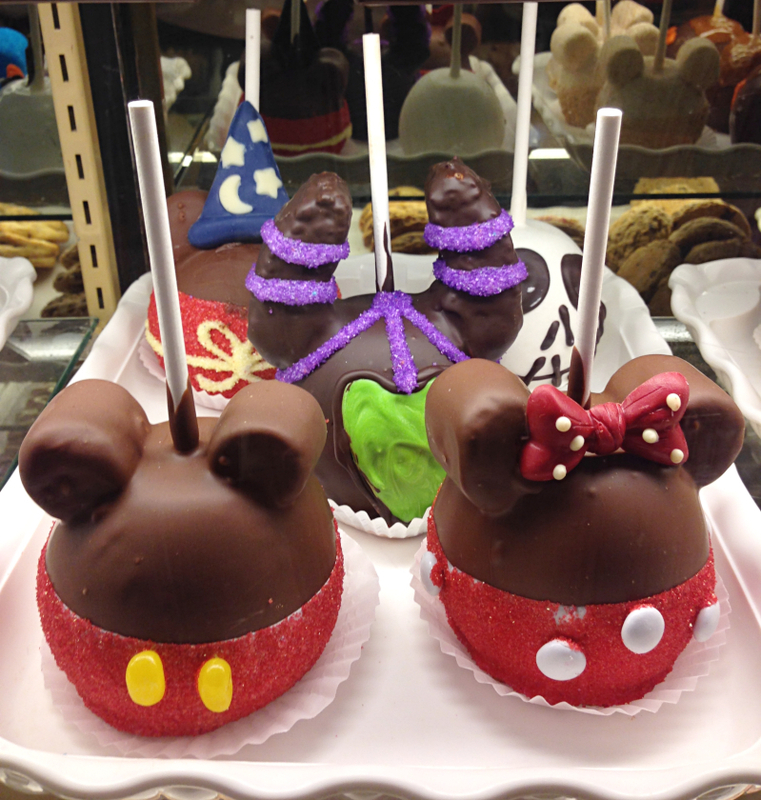 – Maleficent's horns are hand-molded Rice Krispie treats stuck onto the caramel prior to the apple being dipped in black colored chocolate. – Olaf's nose is a dipped & orange sugared Bugle, his hair sprigs are chocolate-dipped licorice strips, & his pupils are black M&Ms. 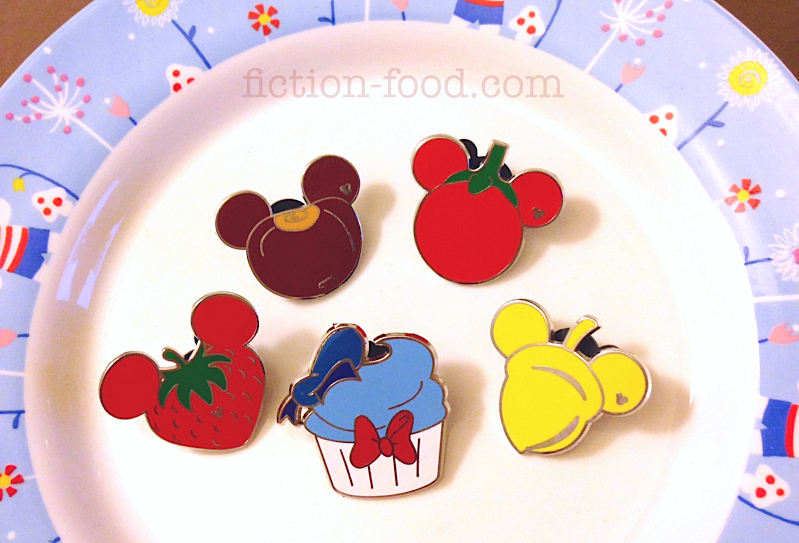 – Mickey's buttons are small yellow jelly beans applied to the white coating before the red sugar. – Minnie's polka dots are white M&M-like candies affixed before the red sugar is spooned on. 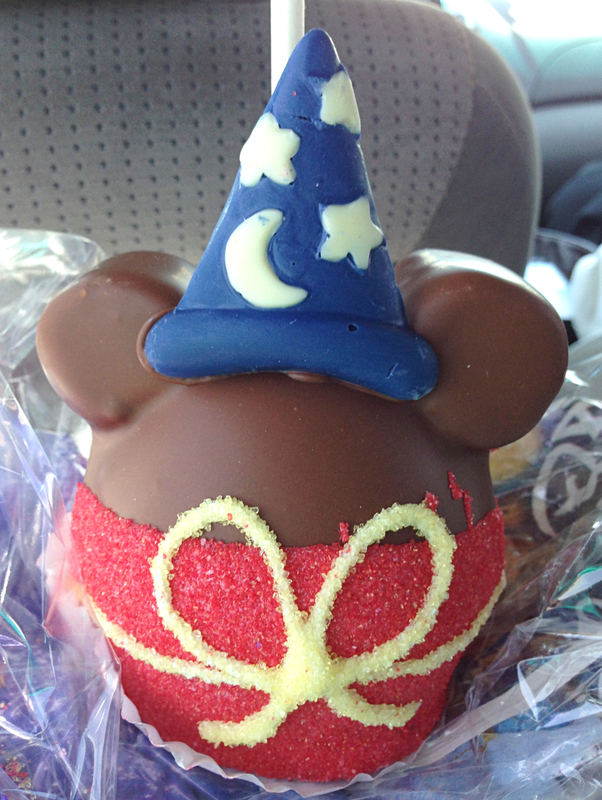 – Sorcerer's Apprentice Mickey's hat & Minnie's bow are completely chocolate (colored) made in special candy molds & then affixed using a squeeze of milk chocolate. I bought the Sorcerer's Apprentice Mickey and totally loved it! It was so big I had to eat it in increments (Heather over at "The Disney Food Blog" recommends using an apple divider. Great idea!). You can see the layers in the photos below. 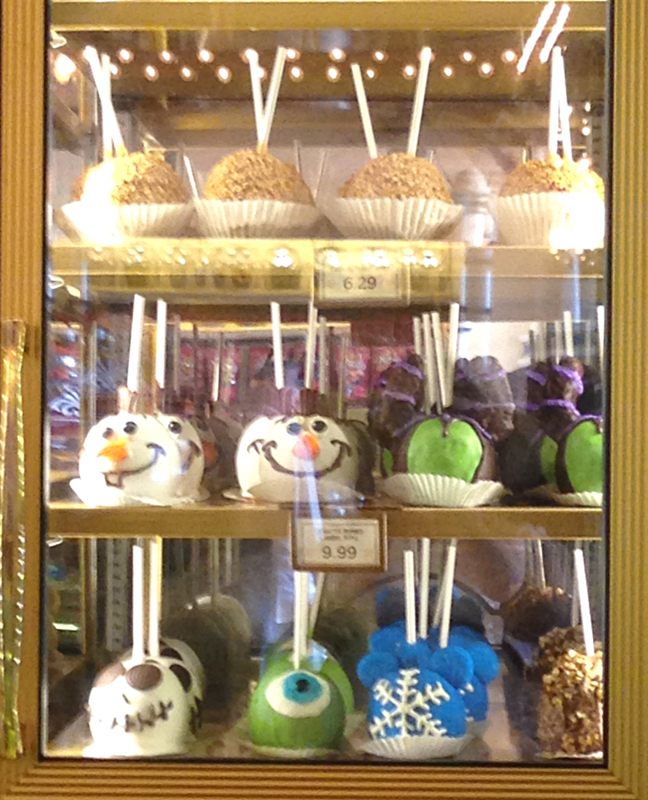 Aside from the apples shown above, there's an array of other impressively designed Disney character creations, like the Cheshire Cat from "Alice in Wonderland", the poison apple from "Snow White", rainbow Mickeys, Sully from "Monsters Inc.", and a bunch of others. 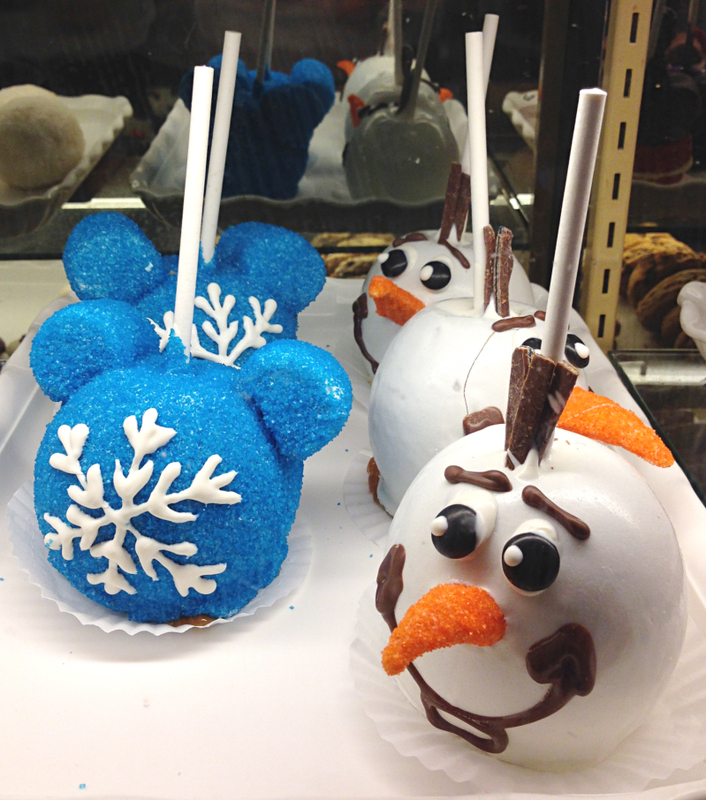 Do you have a favorite Disney character caramel apple? Let me know in the comments! Yep, first time, and it was really great (except for really sore feet). Now looking forward to someday going to Disney World! 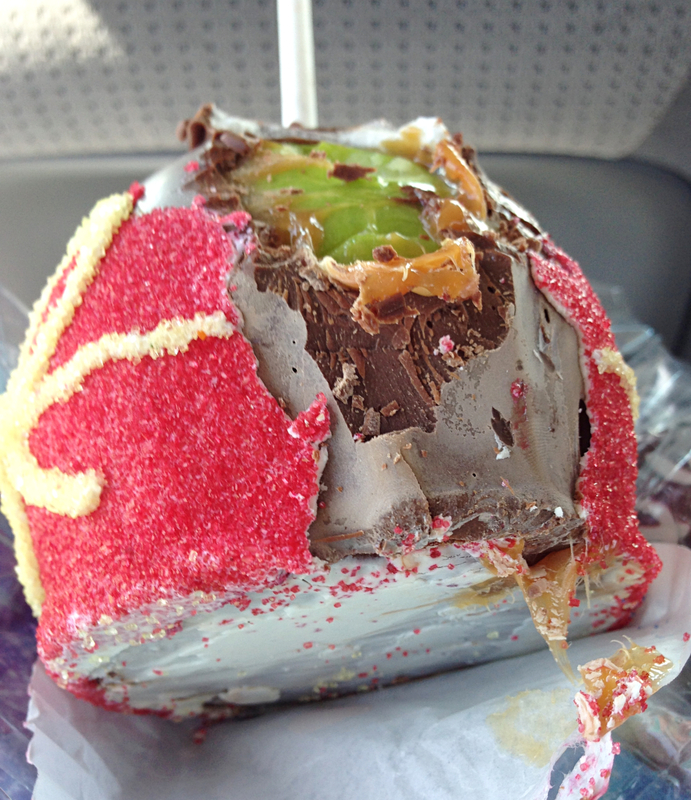 Let me know if you make any caramel apples! It seemed like only a couple of shops had the apples. Yes! Mike Wazowski would be great for Halloween! From what I've seen it looks like a circle of white is layered onto the cooled green coating (for the eye white) and then after that has cooled a smaller circle of white is applied over the first (to become the iris), a black M&M placed in the middle (for the pupil), & then covered w blue sugar (the sugar will only stick to the second white layer as it's not hardened yet). You could even go one extra and stick a couple almond slivers into the green melt before it solidifies to be Mike's little horns!